December 01, 2018 at 7:46 pm. 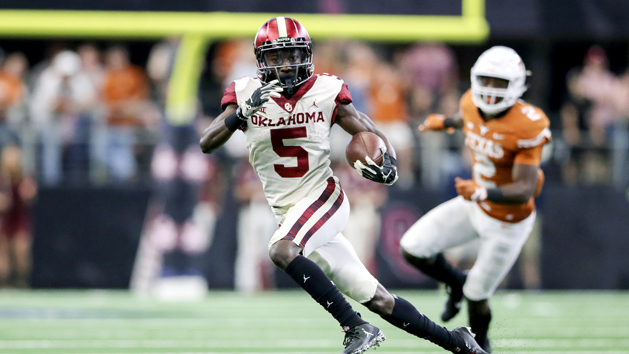 Marquise Brown, Oklahoma’s leading receiver who has battled an ankle sprain for most of the season, left Saturday’s 39-25 victory over Texas with an injury. Brown limped to the bench late in the third quarter after taking a bit hit following a reception. The junior returned to the bench on crutches and in street clothes during the fourth quarter. 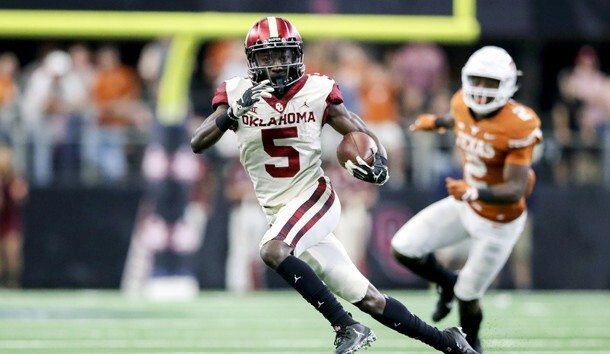 Fifth-ranked Oklahoma (12-1) won its fourth straight Big 12 title with their victory over No. 14 Texas. The Sooners hope to be one of four teams selected when the College Football Playoff pairings are announced Sunday. If they are picked, they will not play until Dec. 29. Brown, an All-Big 12 selection, caught five passes for 54 yards Saturday and has 75 catches for 1,318 yards and 10 touchdowns this season. He had a career-high 11 receptions for 243 yards and two TDs in a 59-56 victory at West Virginia on Nov. 23. Brown, who is 5 feet 10, 168 pounds, is listed at No. 26 on the 2019 NFL Draft Big Board by Rob Rang of NFLDraftScout.com. Brown’s biggest asset is his speed. –Colorado refuted reports that Georgia defensive coordinator Mel Tucker has been offered the job as the school’s next coach. Multiple media outlets reported that Tucker would be officially named as the Buffaloes’ next coach shortly after Georgia faces top-ranked Alabama in Saturday’s SEC Championship Game. Rivals.com reported that Tucker already has interviewed for the position and was expected to be announced as the head coach within 24 to 48 hours. However, Colorado released a statement denying the report while adding that athletic director Rick George has not made a final decision on a successor to Mike MacIntyre. –Central Florida quarterback McKenzie Milton was released from the hospital one week after suffering a gruesome knee injury. ESPN reported that Milton already has undergone three surgical procedures on his right leg and will have reconstructive knee surgery in four to six weeks. The 5-foot-11, 185-pound Milton completed 166 of 279 passes (59.5 percent) for 2,577 yards and 24 touchdowns with five interceptions in his first nine game this season. He had 71 touchdown passes in his career, including 37 last season. –Former Clemson quarterback Kelly Bryant will resume his career in the SEC. Bryant has visit a number of schools since deciding to walk away from the Clemson program earlier this season, but the Kansas City Star reported that he has narrowed his decision to Missouri and Auburn. Earlier this month, Rivals.com reported that Bryant set a deadline of Tuesday to select his graduate transfer destination. Bryant, who announced plans to transfer from Clemson after coach Dabo Swinney chose freshman Trevor Lawrence as the team’s starting quarterback in late September, was to visit Auburn this weekend. –Texas Tech freshman quarterback Alan Bowman has no plans to transfer from the school. There was speculation about Bowman’s future when the university fired coach Kliff Kingsbury on Sunday after the Red Raiders finished 5-7 this season. However, Bowman put to rest any of those worries and said he is eager to work with new coach Matt Wells, who was hired away from Utah State. –Connecticut tight end Tyler Davis is leaving the program. Davis announced on social media Friday that he plans to head to another school as a graduate transfer. Although he did not put up huge overall numbers for the Huskies, with 22 catches for 237 yards, Davis had a team-leading six touchdown receptions this season.